August 6 is the Feast of the Transfiguration. It is also the 69th anniversary of the dropping of an atomic bomb on Hiroshima. In fact, the connection between August 6, the Transfiguration, and war goes back to 1456, when Pope Callixtus III established that day for the Feast of the Transfiguration, in celebration of the victory of Hungarian forces led by John Hunyadi over the Turks which temporarily stopped the advance of the Ottoman Empire into Europe. For those of us who grew up after World War II, Hiroshima and Nagasaki were frightening symbols of the power of atomic weapons and of the horrible destruction they could unleash. The unimaginable suffering of those who died and survived created indelible images that were balanced by the equally unimaginable suffering caused by the war that was ended by Japan’s surrender. In the decades since August 6 1945, we witnessed continued war and suffering, but thankfully no more use of atomic weapons. This summer we commemorate not just Hiroshima but also the 100th anniversary of the beginning of World War I. We witness wars and violence in Gaza, Syria, Iraq, Ukraine, as well as in central Africa. O God, who before the passion of your only­begotten Son revealed his glory upon the holy mountain: Grant to us that we, beholding by faith the light of his countenance, may be strengthened to bear our cross, and be changed into his likeness from glory to glory; through Jesus Christ our Lord, who lives and reigns with you and the Holy Spirit, one God, for ever and ever. Amen. Even more interesting is the focus of the petition. The prayer is not asking help for us to believe in the ascension, but rather that we might have faith to “perceive that … he abides with his Church.” To put it another way, it’s harder to believe in Christ’s continuing presence in the Church than in the Ascension. On second thought, that might not be so strange at all, given the realities of the church in the twenty-first century. 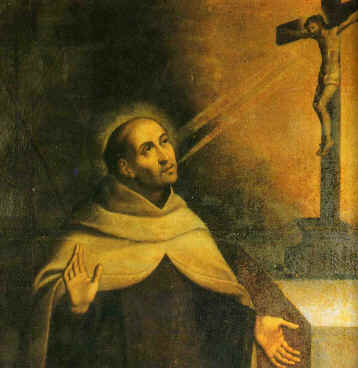 Today is the commemoration of the great Spanish mystic, St. John of the Cross. My blog post from last year is here. And abandoned me in my groaning, O my Beloved? Tell Him I languish, suffer, and die. Tell me, has He passed by you? Oh! who can heal me? Who cannot tell me what I wish. I know not what, of which they are darkly speaking. From your conceptions of the Beloved. Next Sunday is the last Sunday of the liturgical year, known as Christ the King. Next Sunday, the first Sunday in Advent, begins a new lectionary cycle. Advent will begin with a focus on the coming of Jesus Christ—both his first coming and his second. Today’s lessons also focus on Christ’s second coming and our lessons emphasize Christ reigning in majesty and his reigning as a judge. This gospel reading is not only our last for this year. It is also the last substantive teaching that Jesus gives his disciples before his crucifixion. So, for Matthew, apart from a few commandments Jesus gives his disciples—the institution of the Eucharist and the Great Commission—this story is Jesus’ last words to his disciples. So it’s an important story, not simply because it’s a favorite of those who see the Gospel message as primarily one of outreach to the needy. It’s important for Matthew, too. It’s an apocalyptic vision. Jesus is describing what the Parousia—the coming of the Son of Man will be like. First, he uses royal imagery. He will come in glory and sit on his heavenly throne. 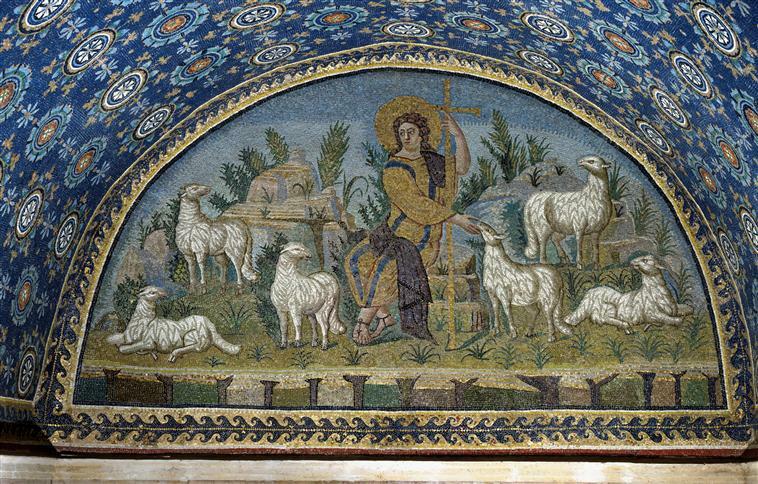 But immediately, that imagery is combined with another image, that of the shepherd. He will separate the people like a shepherd separates his flocks, the sheep from the goats. This image may draw us back to the reading from Ezekiel, where another visionary sees God coming like a shepherd, judging between the fat sheep and the lean sheep, rescuing them from wherever they have been scattered, feeding them, binding up the injured. We might find it odd that these two images—the shepherd and the king—are linked together in the biblical tradition. As the reading from Ezekiel makes clear, one reason for that linkage is the tradition that the founder of the Davidic monarchy—King David, was a shepherd. But for Christians, when shepherd imagery is used of Jesus, it is almost always used to emphasize Jesus’ care for us and his intimate love for us. Yet here in Ezekiel, the shepherd is a judge who culls his flocks, separating the fat from the lean sheep. So too in the gospel, the Shepherd King is a Judge who divides the sheep from the goats. In the Ezekiel passage the contrast between the care and tender concern the shepherd shows for the lean sheep and the harsh words with which he judges the fat. The same is true in the gospel. The king judges harshly, unequivocally between the sheep and the goats. 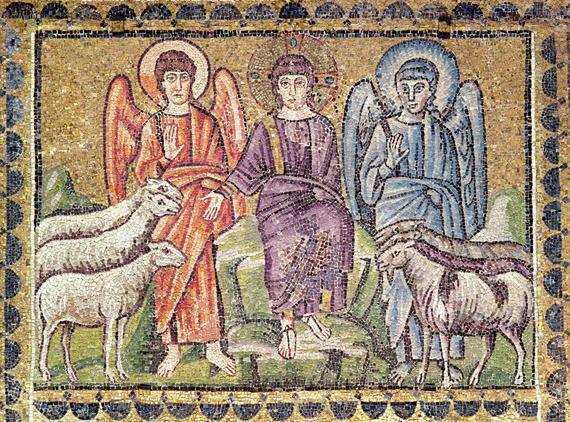 Christ appears to us here as a shepherd-king, but there are two other important images of Christ in the gospel. One is the obvious one. When the king says, inasmuch as you did it to one of the least of these my brothers and sisters, you did it to me, identifies the presence of Christ in the naked, the prisoner, the hungry, the sick. The third image is less obvious. The text begins with a reference to the Son of Man. In Matthew, when Jesus uses that title of himself, it almost always is in reference to his crucifixion. Christ the King is also the Crucified One and the least of these. We are called to hold these three images together, we might think of them as three facets of a prism that together refract the light. If we ignore one of them, the other two become less brilliant. Emphasizing one over the other is a common temptation for Christians, but the gospel itself warns against it. We might prefer one image over the other. Some might want to encounter Christ only in the face of the poor and hungry; others only in an image of the Crucifixion. There are even those who can conceive of Christ only as the judge who comes on a cloud of thunder and reigns in majesty. Each image taken by itself will lead to a distortion of our faith. Those who focus only on the crucifixion will see Jesus only as the one who offers forgiveness for our sins. Those who focus on Christ in Majesty will think only about the second coming and making sure that they are on his right side. Those who focus only on outreach to others turn the Christian message into a social service agency. The judge separates sheep from goats, those who reached out to the needy and those who didn’t. The surprising thing here is that all are surprised. Neither group knew that Christ was present in the naked, the stranger or the prisoner. So for those whom the King welcomed into the kingdom, their actions in reaching out to the needy were not a conscious response to Jesus’ teachings or the result of acting out of duty or in order to gain their salvation. Their actions were an unconscious, unknowing part of who they were as Jesus’ disciples. Since arriving at Grace last year, I’ve been intrigued by the possibilities and limitations presented by Grace’s location and physical space. The church itself is quite beautiful and its high-profile location are incredible pluses. But there are challenges as well–parking, for example, is one and the presence of the homeless shelter makes security an issue, too. Still, I have wanted to offer a robust schedule of weekday services, to reach out to our neighbors. Several lay people have mentioned over the past few months that they would appreciate the opportunity to attend and to officiate at Evening Prayer, and after talking to a number of people, I thought it would be an interesting experiment to try it during Advent. After one week, I can say that it has been an interesting experiment. The numbers have not been been overwhelming, but I’ve not had to say it alone. What has surprised me is the effect on me of saying Evening Prayer in a lighted church as evening darkens. The season of Advent is all about light shining in the darkness. Turning the lights on at Grace after 5:00pm, and lighting candles in the nave to prepare for the service, are reminders of the coming of the light of Christ into the darkness of the world. But more than that, there’s something about saying the familiar words of evening prayer, as the evening darkens, as people make there way home after a workday, and while the men are lining up to enter the shelter on the other side of the courtyard. Tonight we read Psalm 22–that powerful, gut-wrenching Psalm that Jesus quoted on the cross, and that we recite on Maundy Thursday during the stripping of the altar. To read that Psalm now, in the midst of our anticipation of the coming of Christ, is a jarring reminder of how this story ends. The hope and anticipation of Advent ends, it seems, in a body broken, shattered, dying on the cross. Of course, that’s not the end. Still, to celebrate Advent in the light, not only that shines in the darkness, but in the light of crucifixion and resurrection, challenges everything we understand about the season. There’s also something about praying while the world walks by. Perhaps I’ll have more to say about that another time. I received an inquiry today from someone who wanted to know if we had a service today. We don’t, and until she asked, I hadn’t even considered the possibility. We celebrate All Saints on the Sunday following November 1. So far as I can remember, that’s been the custom at every parish I’ve been at. That’s going to change. All Saints is one of my favorite celebrations of the church year. I probably say that about all of them, but All Saints is unique because of what it is about. As I was writing a brief description of the service for our parish newsletter, I came across this explanation: “In the Prayer Book tradition All Saints’ Day is essentially a celebration of Christ in his whole Mystical Body—the ‘elect’ and the ‘saints’ in the New Testament sense of these terms.” (Quoted in Hatchett’s Commentary on the Book of Common Prayer). It’s a celebration of the church; to use traditional language with which I am uncomfortable, the Church Militant and the Church Triumphant. It’s an important reminder that the community to which belong encompasses both the living and the dead; that we are united in our faith in the Risen Christ, all members of his body. I want to sing Sine Nomine today–Ralph Vaughan Williams’ majestic “For All the Saints.” I want to hear the lessons that are appointed for the day. I want to join with my brothers and sisters on earth and in heaven in one hymn of praise.